The history of body painting goes back to the caveman. Once the caveman had fire he had a pigment that could be pushed into the skin (soot) and tattooing was born! This was many centuries before the first tattooed man stepped on a stage as a tattoo attraction. Once the precedent was set there was no looking back. By the early 1800s American circuses were operating and this gave the promoters and attractions a better venue to work in. 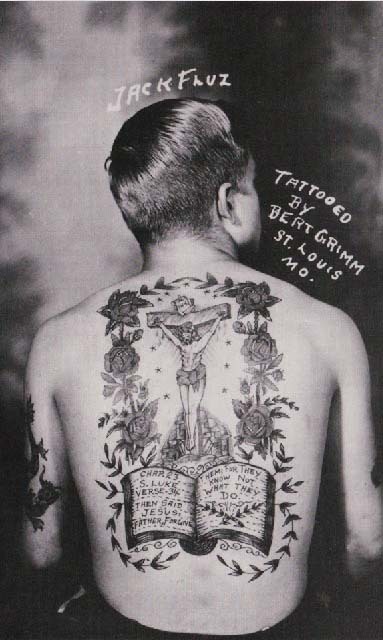 With the advent of professional tattooing, the look of these tattooed men also began to change. Early attractions from Prince Giolo in 1692 to James O’Connell in 1850 were tattooed in what is now known as tribal style; the tattoo designs were more geometric, consisting of circles, squares, lines, dots, dashes, triangles etc.